The episode opens with Frasier excited about spending Christmas with his family. There's a sequence at his office Christmas party introducing several elements: there's a drunk woman he's supposed to drive home, Ross got him a better gift than he got her, and one of his coworkers wants him to take his Christmas shift. Only one of these actually extends beyond the opening sequence and influences the episode at all. The others, which feel like plot hooks, just evaporate. I'm not really complaining: the amorous drunken woman and a gift imbalance aren't exactly episode premises I needed to see developed, but I'm baffled as to why they were included then left unresolved. 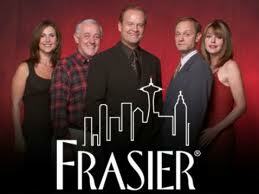 Frasier gets home and receives some bad news: his son will be spending Christmas with his ex-wife instead of him. This leaves him depressed, which leads into a fight with his father. Rather than go to the family cabin, Frasier decides to work on Christmas (yeah, that required us to sit through the office party for set-up). The next sequence showcases Frasier taking calls from depressed people on Christmas. Needless to say, this gets old pretty fast. Frasier then goes out to eat at a restaurant. He discovers he forgot his wallet, which results in the other patrons mistaking him for a homeless man and paying his tab. This, of course, is the miracle the rekindles his Christmas spirit or something. This wasn't awful, but it was overwhelmingly bland. It felt empty, vapid, dull. I used to occasionally watch Frasier back when I was in high school. I don't recall particularly liking or disliking it, but I didn't have cable growing up so I took what entertainment I could get. Thank God those days are past.